Seventy-nine world governments have sprayed the anti-global warming chemical CW7 into the atmosphere to cool the earth. Everyone on earth has frozen to death, except for passengers on the passenger train the Snowpiercer. The train has been running for 18 years continuously. People in the back of the train are treated like chattel. Soldiers protect Wilfred (Ed Harris) the creator of the train’s perpetual engine from the people in the back of the train Curtis (Chris Evans) and Gilliam (John Hurt) plan a revolution against Wilfred, and his minions. Curtis is joined in the battle by Tanya (Octavia Spencer) whose son Timmy (Marcanthonee Reies) has been taken by the soldiers to the front of the train, under suspicious circumstances. Curtis also bribes security expert Nam Minsoo (Kang Ho Song) and his daughter Yona (Ah-Sung Ko) with Kronole a hallucinogenic drug. Curtis needs Nam to open the locks that separate the compartments of the train. Do Curtis, Nam, Yona and Tanya make it to the front of the train? What has happened to Timmy? There are many familiar elements to this story, it’s a dystopian society on a train, people are given a mind altering drug to keep them content, much like Soma in the book Brave New World, and there’s a definite social strata where the poor are given questionable looking gelatinized protein bars reminiscent of Soylent Green, while the people near the front of the train dine on specially bred sushi. The train is certainly a metaphor for society, but because the director and writer is Korean, I believe the train is a metaphor for North Korea. The lower strata of society is left to starve while the upper classes enjoy the finer things in life, and the creator of the train is deified and followed with an intense, almost religious fervor. A lot of the story is far-fetched, how can a train run for 18 years, in a constant snowstorm? How can plants and fish be grown inside of a train? There are many plot holes, and the viewer must leave logic at the door in order to get to the ending, but the ending is worth all the suspension of disbelief that goes on beforehand. It is an extremely violent film with a lot of close combat, so this is definitely not a movie for kids, or adults who don’t like excessive violence, but the metaphor is an interesting one, and there’s some global warming skepticism thrown in to boot, which will no doubt please some political conservatives. The acting is good. Chris Evans brings a lot of intensity to the role. If I have a problem with Evans’ performance, it’s that his performance is a one-note performance which lacks nuance. John Hurt and Tilda Swinton are wasted as Evans’ cohort and a mid-level conduit to Wilfred. Octavia Spencer basically plays a mother whose grief for her missing son drives her forward. The Korean actors, Kang Ho Song and Ah-Sung Ko are very good as a pair of drug addicted wild-cards, the viewer never fully knows where their allegiances lie, and if their loyalty is up for sale .Ed Harris plays a role very similar to the role he played in The Truman Show, the train is his world and he likes being in control of it. He’s good at these kind of roles and brings a certain serenity to the madness around him. The movie is too long, director Joon Ho-Bong could have cut about a half hour out of his script to improve the pacing. There is nothing visually arresting about this movie, and the actors are mostly veteran actors so I doubt that Bong gave them different readings on how to play certain scenes. Snowpiercer: A lot of tough sledding, but a nice payoff. WWII is raging in Europe. In Norway, Nazi soldier Jonathan Schmidt (Hugo Weaving) steals a powerful cube with untold powers. Schmidt intends to take over the world. Back in Brooklyn, NY, Steve Rogers (Chris Evans) is a small, skinny runt, who keeps trying to join the Army. He wants to emulate his friend, James “Bucky” Barnes (Sebastian Stan) who is already in the military. 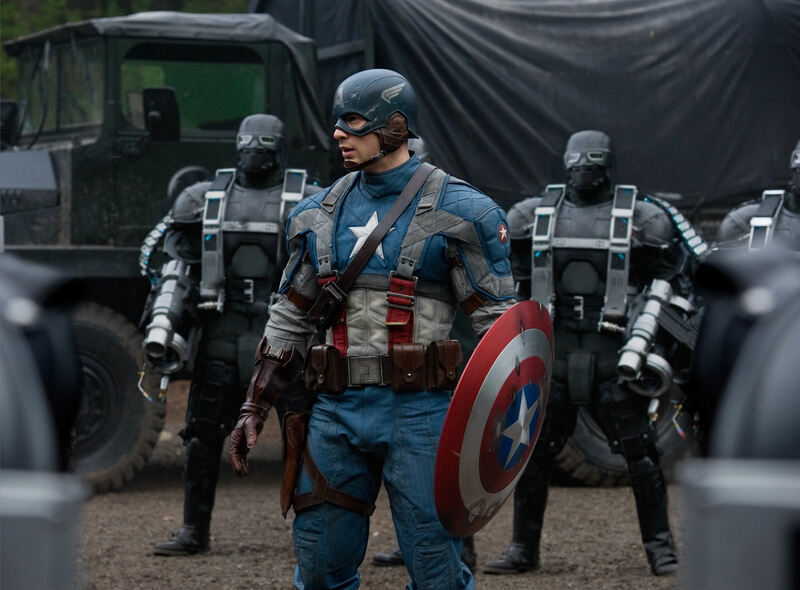 Steve is so desperate to join the fight and fight the Nazis that he volunteers for an experimental program to design a super soldier, headed by Dr. Abraham Erskine, (Stanley Tucci) British agent Peggy Carter (Hayley Atwell) Colonel Chester Phillips (Tommy Lee Jones) and Howard Stark (Dominc Cooper). After the super soldier injections are complete, Steve grows and becomes muscular, but a Nazi spy breaks into the lab and kills Dr Erskine. Steve chases down and kills the spy, but then is woefully underused, and made a USO attraction, used to sell war bonds. After Steve learns that his friend Bucky is missing, he flies behind enemy lines with Howard and Peggy. Not only does Steve find Bucky but 400 other POW’s. While Steve finds the POW’s, Schmidt and Dr. Zola are trying to harness the power of the cube. Steve and the 400 POW’s storm Schmidt’s HQ. Does Steve overpower Schmidt? Does Schmidt and Zola perfect the power of the cube? I love this movie. There are lots of reasons why. This is a story of the underdog, the little guy who keeps on fighting to attain his dream. He has a best friend, who he wants to be in the army with, he’s never danced with a girl, isn’t that everybody’s story? And even with muscles and height, there are still obstacles in his way. The villain is a true villain, he makes Hitler look like a boy scout and that is not easy to do. The banter between Steve and Bucky sounds like two friends going back and forth. The banter between Steve and Peggy sounds like lovers fighting. The acting is great, and that makes the movie better. Chris Evans is so good as Steve Rogers that I rooted him from the first scene on. Hayley Atwell is one hell of a love interest, and she can act too. Hugo Weaving is pure evil as Schmidt, he revels in being a bad guy and he does it well. Tommy Lee Jones looks like he was meant to be in a military uniform. Stanley Tucci is great in a cameo role as the scientist who really wants to help Steve. Dominic Copper plays Howard Stark, as a fun loving flirtatious womanizer, and adds a nice touch of comedy to the proceedings. Then came the last scene, which looked like it was taped on, with Scotch tape, it was so sloppily done, all for the sake of a sequel. But the tacked on ending did not ruin the movie. OK so The Green Hornet, The Green Lantern, and Thor make Captain America look like Shakespeare, but that shouldn’t matter, and it doesn’t matter. Captain America. We all have a little Captain in us.